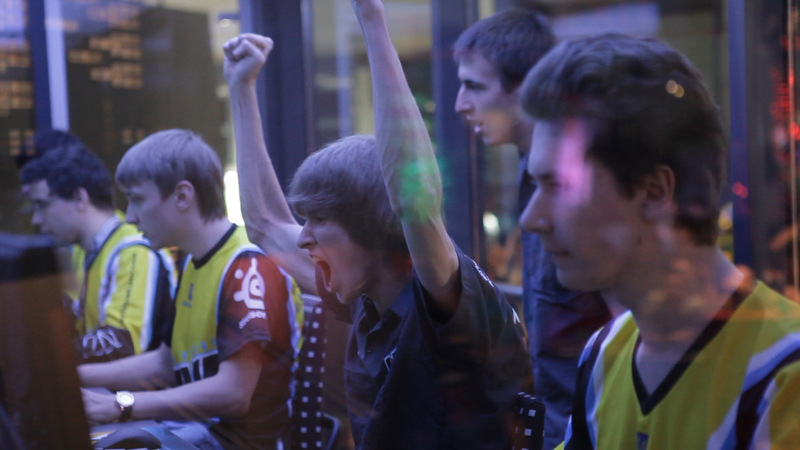 Danil “Dendi” Ishutin cheering as he feeds another kill to the enemy in the most important match of his life. Earlier today, Valve finally announced the official release of their long-awaited documentary, Free to Play. The documentary has been in the works for nearly three years now, even though a mostly-completed version of the film debuted at the enormous, Valve-hosted Dota 2 tournament, The International 2013. The film follows three professional Dota 2 players as they pursue their dream of becoming the first champions of the then-unreleased game, and claim the million-dollar prize that comes along with The International 2011 championship title. By impeccably weaving together in-game battles, personal interviews, and actual tournament footage, Valve creates possibly the most emotionally exhilarating and inspiring gaming documentary yet. The film follows three past and current Dota 2 players: the recently returned Benedict “HyHy” Lim of Singapore; Clinton “Fear” Loomis (frequently referred to as the “old man” of Dota at age 26); and perhaps most famously, Danil “Dendi” Ishutin of Natus Vincere, the only team to become finalists in all three of Valve’s The International tournaments. To put this simply, the film does an incredible job of humanizing these professionals gamers who are more often associated with social anxiety or mouth-breathing neckbeards than with being actual humans with their own stories and emotions. Lim, the product of a highly conservative Singaporean upbringing, is constantly criticized by his parents for putting so much time into “worthless video games”, while both Loomis and Ishutin are pushed to achieve success through personal loss and pain. Without giving too much away about Free to Play, which I was privileged enough to view at The International 2013, it is a monster of a documentary in more ways than one. The traditional sports narratives of physically overcoming adversity in a battle of brawn between players is revamped in Free to Play. Valve uses this documentary as an assertive challenge to the mainstream by making the similarities between traditional sports and “esports” uncounterable: mechanical skill, mental acuity and the ability to hold up under pressure are hallmarks of all competition, gaming included. While competitive gaming has largely been ignored and mocked for not truly being a legitimate arena for competition, no one who walks out of the theater after seeing this documentary can make the same argument. Like I said before, I don’t want to spoil too much about the film, so I’ll leave you with this: watch Free to Play. If you have ever had the smallest interest in gaming, competitive or otherwise, you will find something beautiful in this film. Free to Play is able to take the individual narratives of three players––triumph, loss, pain, teamwork, growth, insecurity––and turn those narratives into a film that masterfully and empathetically places us in their shoes from the very moment it starts. Their joy and pain are shared with the audience in such an impactful way that leaving your chair with dry eyes may make me question your humanity. Valve will be releasing Free to Play on March 19th through Steam. You can find the official website here, or you can follow this link to the Steam Store where the documentary will be released. If you are in the greater Bay Area and are interested in attending the premiere event, click here. You can find the trailer for Free to Play below.